In just a few years R-Pod trailer trailers have made an impact in the recreational industry’s ultra-lite towable sales market. Though considered an ultra-light trailer by many and not an official teardrop, Forest River considers it to fit both categories. When Forest River first introduced its R-Pod travel trailer in 2008 it became an immediate success. The R-Pod is now available in thirteen floor plans with lengths between 18’4″ and 22’2″. Eleven of the units feature a slide and many units offer an option called the R-Dome, a screened awning room. The chassis is a powdered coated steel frame holding a one-piece, seamless fiberglass roof unit. Features include a gas/electric DSI water heater, a 3.7 cu ft 3 way refrigerator (Gas, Electric, 12V), a 2-burner stove, a 20,000 BTU furnace, shower, and toilet. The R-Pod travel trailers have a unique feature; a pop-out tent area (only a few have this feature) made of Aqualon™ which is a heavy-duty, yet breathable material that remains flexible in all climates and is resistant to mold and mildew. Some models also offer a rear garage option, much like a tailgate, which provides outside entertainment. Each garage R-Pod model comes with a 19″ flat screen TV, marine grade speakers, sink, sliding storage, and a gas grill. First, your fresh water, grey, and black tank capacities are larger on the R-pod. For those that might be staying in places where access to water is limited, those extra gallons can make a big difference. Second, the large selection of floor plans available in the R-pod mean that it is much easier for campers to find a model that will meet their unique needs. For example, only the R-pod model 191 features twin beds with a center night stand in the sleeping area. Third, for those really tall folks, the extra inch of head space in the R-pod might be important. In closing, shoppers that prefer to have a variety of floor plans and camping options that they can customize based on their needs and travel plans will want to be sure and look at the Forest River R-pod before making a final decision. 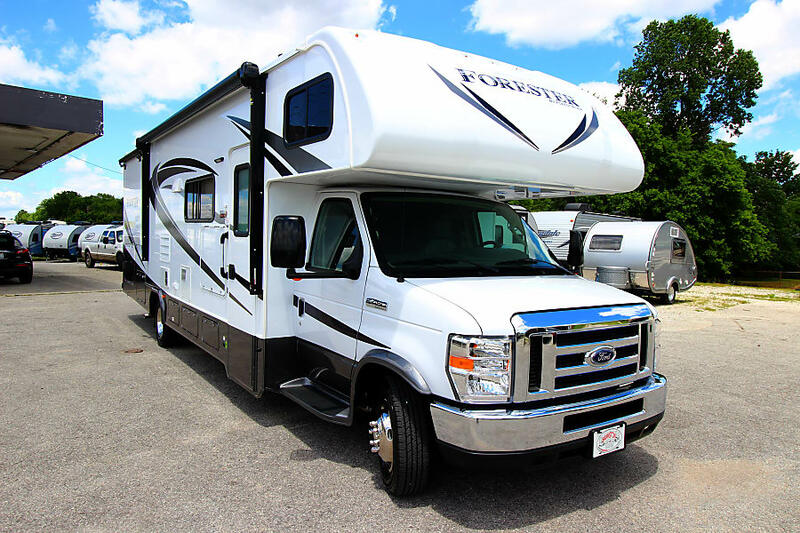 Its roomy interior is surprising given its smaller size, and the attention to camper-friendly accessories and options have made it an RV customer favorite. And for those that are looking for a community, the r-pod nation forum is filled with happy R-pod owners that are active on-line to help those new to the R-pod experience make the most of their new RV. RV camping doesn’t have to mean “roughing it.” You can travel in style by visiting one (or more!) of the best RV parks in the U.S. Here are a few of our favorites. Do you cringe when you hear the word camping? You must imagine tents, dirt, and no showers. While camping is not for everyone, taking an RV out for a spin is hardly “roughing it.” You can have all the comforts of a house while still being open for adventure. Lots of people have the same idea. In fact, 10 million American households own an RV. If you’ve ever thought about what it would be like to explore the great outdoors, an RV could be the solution. But where would you take your RV to? Keep reading this article to learn about the best RV parks in the U.S. If you’re looking for the ultimate RV campground experience, then you need to put Denali National Park on the top of your list. This national park is located in Alaska in the center of nature and spectacular wildlife. The park has three RV-friendly campgrounds: Riley Creek, Teklanika River, and Savage River. Keep in mind you have to make a reservation far in advance through a third party–the National Park doesn’t handle the reservations. Without a doubt, if you plan on taking your RV for a spin, you have to visit the legendary Yosemite National Park. Yosemite National Park has ten RV campsites for you to choose from. Be aware that electrical, sewer and water hookups won’t be available. The only dump station is available at Upper Pines campground, so you should go prepared. Also, campgrounds at Yosemite book fast, so make sure you book as early as possible. You’ve probably thought about taking a road trip down the Pacific Highway at some point in your life. Well if you own an RV, why not make this a reality? Fernwood Campground and Resort is right in the heart of Big Sur, California. RV campsites have access to water and electricity so you can enjoy nature without giving up some comforts. If you’ve always dreamed of exploring the Pacific Northwest, it’s time you take your RV to Crater Lake RV Park. It’s recommended you plan for at least a week in order to experience everything there is to see. The campsite has access to 30, 40, and 50 amp hook-ups and access to telephone lines. Also, they have free wi-fi, so you don’t have to feel disconnected from the outside world. Not to mention you’ll have access to clean bathrooms and showers. If you think enjoying an RV resort is always about getting in touch with nature, then we should let you know that there are RV resorts that are all about luxury rather than “nature” and “the great outdoors”. LVM Resort in Las Vegas is an RV luxury resort located only minutes from the strip. This resort offers all of the amenities of a 5-star hotel but you can sleep in the familiarity of your RV. LMV has a full-size swimming pool, two whirlpools, and even a tanning pool. Visitors can also enjoy the clubhouse, on-site restaurant, fitness center, and spa. Check Out the Best RV Parks in the U.S.
Now that you know about some of the best RV parks in the U.S., it’s time to take your RV for a spin. So where is it going to be, LVM, Denali, or Yosemite? And if there are a few more you think others should know about please share them in the comments! We would love to update this article with more of the Best RV Parks in the U.S. in several months. If you enjoyed these ideas and would like to learn read more about road trip tips for your RV, check out our blog! When it comes to retirement, a lot of people think of moving to a new house or buying a new car. So, why not do both? Selling it all and living in an RV is the new best way to enjoy retired life. Think about it, having the freedom to live wherever you want at a moment’s notice. You could spend each day waking up somewhere new and have an adventure. You’re no longer held down by work. Retirement gives you a whole new lease on life and now you can live it to the fullest. Does retirement RV living sound appealing to you? Read on for 3 steps on how to make it a reality. If RV life seems right for you, you’re in for one heck of an adventure. There are a lot of things to think about, but let’s start with the basics. These 3 steps will help you on the right track and get the ball rolling for your new dream lifestyle. You can’t start the RV life without first having an RV. The first step it to find the right one for you based on how you plan to travel. Spend some time researching different kinds of RVs. There are Class As, Travel Trailers, Fifth Wheels and more. We can’t tell you which one to get, it all depends on your individual needs. It’s good to make a list of the types of places you want to visit and check out their parking options and space limits. For example, if Yellowstone National Park is on your must-see list, parking spots accommodating a length of 40 feet or more are limited. Or if you plan to visit the Grand Canyon, parking on the South Rim can be challenging for vehicles over 22 feet long during peak season. The longer you plan on traveling, the more you’ll want the comforts of home and its conveniences. Class As are perfect for long-haul trips, and smaller travel trailers are ideal for camping weekends away. Figure out if you want to rent or buy. Renting may be the best option if you plan on doing shorter stints. Renting also lets you try before you buy. It gives you a first-hand experience and helps inform your decision when it comes to buying. 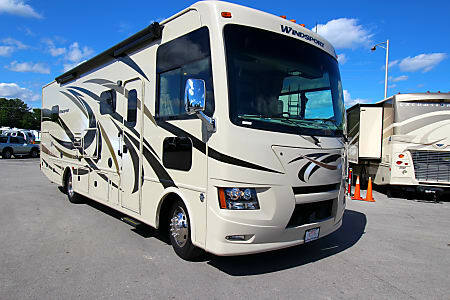 When you buy an RV, you have the freedom to pick up and leave at any time. But it is an investment, so think about your budget. The physical act of downsizing is a big one to consider. If you’re moving into an RV for long periods of time, you’ll need to purge a lot of the extra things from your life. Decide which possessions you’ll be selling, consigning, donating, or putting in storage. Even if you choose to purchase a 5th wheel or a Class A Motorhome (which have large storage options), an RV often can’t fit everything a home owner has accumulated over the years. Minimalism in your life has a lot of benefits and can be a much more rewarding way to live. But it’s not for everyone. We recommend going on a trial trip to see how well you can manage life without everything from home. Emotional preparation is important too. Leaving home means leaving friends and family for extended periods of time. Are you ready for that? How long will you be away for? These are important factors to consider and it’s different for everyone. Consider any health concerns you or your spouse may have. As we get older we’re more prone to medical issues. Do you need to have regular doctor visits, or is it a case of taking medication with you? You and your spouse have worked together to save for retirement. Now is the time to enjoy it! Whether you’re entering RV life or not, now is the perfect time to develop an in-depth budget plan for your retirement. You want to account for the costs of the RV you choose. Whether you are renting or buying, you need to know how much you’ll be spending. Buying costs more than renting, of course. However, RVs have a huge range from $20k to $300k, so if you really want to hit the open road and RV full-time there are plenty of options to choose from! Also consider costs for gas, maintenance, and food. Make sure to plan for other charges you’ll encounter along the road too. For example, there are different costs associated with different places to stay, so be sure to factor in state park fees, RV resort fees, or special memberships you might decide to take advantage of. RV living can be luxurious or simple – you’ll have to decide which route you prefer to go. Most important of all, have fun! Make an itinerary, and plan your trip out. You’ll be in for one of the best adventures of your life. If you’ve decided retirement RV living is the thing for you, congratulations! This new way of life could be everything you’ve ever dreamed of. Follow these 3 steps and you’ll be well on your way to full-time RV life. Interested in learning more about RV living? Check out our other posts for additional tips and inspiration! Do you want to go on the ultimate RV trip this summer but it’s your first time RVing? Take a look at these essential RV travel tips that every first-timer should know. Have you heard the news? RV’s are back, front and center in the hearts of the American population. There were 15% more sales of RVs in the last year alone, and with sales steadily rising since the 2009 financial meltdown, the popularity of RVs has never been better. Whether you’re young or old, traveling in an RV has something to offer, especially if it’s your first RV road trip. With newcomers to RV travel in mind, here are 5 tips that you shouldn’t set off without knowing. Before you set off on your RV trip, you need to check the maximum weight your vehicle can hold. Overloading your RV is an easy mistake for RV newbies to make, but it can be costly. Crashing your RV while it’s overloaded will invalidate your insurance, so it could leave you out of pocket. If nothing else, it puts a heavy strain on your RV and could be illegal. If you run into trouble, don’t worry. Check out the RV servicing solutions we offer for RV owners needing urgent RV repairs. Next on our list of tips for first-time RVers is designed to help you cope with long journeys. Driving can be exhausting, so if you’re driving with a partner, look to share the driving between you. Training up a second driver is also a good idea if you find yourself injured and unable to complete your journey for any reason. If you’ve never driven an RV before, check out these tips on how to handle and drive one. We’re living in a digital world, and if you’re keen to share your holiday snaps with friends and family back home, you’re going to need internet wherever you go. Lots of RV parks and public areas may come with public wi-fi access, but it isn’t guaranteed. Thankfully, you can prepare for wi-fi ‘not-spots’ pretty easily. Pick up a mobile Wireless hotspot device that can connect to the internet over a cell phone network. This will give you internet wherever you go, although you’ll still need a good signal from your cell network for this to work. Be sure to check your current mobile device, many of them come with a hotspot option, which means your phone can easily become a wi-fi hotspot as long as your carrier has coverage where you plan to travel. If you’re going RVing, don’t forget the essentials before you set off. A basic first-aid kit is probably a good idea, packed with bandages and disinfectant at a minimum. We also think you’re going to need some wind-up torches and lamps (you won’t always have electricity to charge batteries). 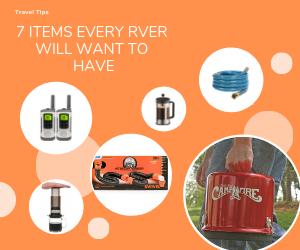 There’s a whole lot of other essentials you could add to this list, so here’s an RV checklist you can use to be sure you’ve packed everything you need. RV life is fun, and most of all, it gives you the chance to be spontaneous. New RVers can find this a tough adjustment, but it’s part of the fun. If you find yourself at a location you enjoy, stay there a week or two longer. You’re in an RV, so the world is your oyster to explore! That said, things don’t always go to plan, even when you don’t have a plan. Travel with a budget in mind, keep a full tank of gas, and have plenty of food and water to keep you going. If you need to find a campsite to stay at, GoCampingAmerica can help you find a park in every state. If you’re looking for freedom, RV travel offers that in spades. Your RV is your gateway to a life of fun and exploration on the road, but a little planning will help you avoid some of the more obvious pitfalls. RV life isn’t for everyone, but if you’re looking for an exciting and low-cost way to travel, investing in an RV could be the best decision you make for your family. Looking to buy an RV, or just to rent? Either way, why not contact us and discover whether our RV sales or rental options are right for your needs. Gas Buddy– it’s free and helps you find the cheapest gas in your area on the go! Gas prices are for USA and Canada only…and for every gas price reported you’ll earn points toward prize giveaway entries…They give away a $100 gas cards to keep reviewers motivated to share info. Oh Ranger! Park Finder is an excellent resource for RVers too -Oh, Ranger! ParkFinder contains an exclusive database with information on thousands of different types of public lands, which can be searched to find activities like RVing, Hiking, Boating, Camping, etc. KOA App– allows users to filter, reserve, and mark campgrounds as a favorite in the app… and driving directions and KOA campground info is supposed to be available off-line which can be super helpful! WeatherBug (for Android and Apple) -When driving and traveling, accurate and current weather info is important for both safety and sight-seeing plans. WeatherBug, the best free weather app, powered by the world’s largest network of professional weather stations, providing the fastest weather alerts, real-time weather conditions, accurate hourly forecasts & 10-day forecasts, 18 weather maps including Doppler radar, satellite, lightning alerts, precipitation, local temperature, local pressure, local radar, wind chill, heat index, humid, wind, pollen, UV and much more! All Stays Camp and RV (iphone only) is on almost ever app review list we found on-line. For those with iphones, a few clicks gives users info on areas to camp and RV. LifePics is an app that is free and lets you order all of your iphone photos throug the LifePics Photofinisher network. This is network hsa over 18,000 stores located all over the world where you can print your photos and pic them up at places like CVS, Office depot, Ritz/Wolf Camera, etc. RVDumps.com – this is not an app- but we tested it on our mobile phones and the website appears to be mobile responsive. Plus, we could not find another app that provides dumping station info nationwide. Using a mobile phone as a hot spot, or using free wi-fi at a restaurant, RVers can hop on RVDumps.com and find a geographic map of the US and then navigate visually by selecting a state, and selecting different push-pin location markers for dump stations. What’s fabulous is the little pop up for each push-pin will show if the dump station is supposed to be free or if a fee is required. It also appears as if the free dump stations might color coded differently from the paid dump stations. When testing the light blue ones seemed to be free and the dark blue icons appeared to be paid. There are plenty of other travel apps and sight seeing apps to choose from, but with these top picks installed on your phone you’ll be well on your way to a successful trip this spring! Top 3 Reasons Why Renting an RV is a Smart Choice. Our family took out the Thor Chateau 28Z recently. This was our first trip in a Chateau, and it was noticeably smaller than the Forest River 3011DS (29ft 11 inches versus 32 ft 3 inches in the 3011DS). However, even with about a yard difference in length, we had ample room for our family of four. The Chateau is designed to sleep 7, but that may depend on the size of your travelers. Reviewing the sleeping lay out, let’s start with the dinette that converts to a sleeping space. Our 9 yr old son had no problem sleeping in the space, but it might be tight if your kids are a bit older or larger. However, the bunk over cab area is quite spacious and does not disappoint. Plus, the sofa across from the dinette converts to a queen. Therefore, if your family has a few teen-age kids, there is ample room for at least 2 in the bunk over the cab, 2 on the queen sleeper, and one on the dinette (2 if they are small!). Including two more adults sleeping in the bedroom this Class C will easily sleep 7. A couple of other positives worth noting: there are plenty of seat belts for travelers to choose between when riding in the cabin of the RV. The dinette had two seatbelts and the sofa had three, so passengers have good seating choices when riding along. We also liked that the ladder for the bunk over cab could stay down while my son slept in the dinette area. This made it easy for the bunk sleeper to get down and visit the restroom at night, or get a drink from the kitchen, etc. There were plenty of plugs for our electronics in the Chateau as well. This was also our first time going to an area that had no campsites available. Due to the lack of camp parking & the influx of travelers, we chose to stay in a Walmart parking lot overnight. The Chateau had plenty of privacy blinds and finding a place to park was not an issue at all. My husband had called ahead to ask (just to be safe!) and the manager on duty suggested that we part around the side, so we did. The only surprise we had was in the morning when I walked out – there was a Class A parked in the next aisle over. To summarize, we found the Chateau very comfy. The few ‘cons’ that we noticed were the turning radius (my husband commented on this while navigating the 2 lane county roads we took to avoid I-65), the lack of stabilizers to help it rock a bit less while parked, and the smaller restroom (as compared to the Forest River 3011DS with the shower on one side and the lavatory on the other). The Thor Chateau has a few key ‘pros’ that make it an excellent choice for those that want a Class C under 30 feet long. First, it has a very efficient floor plan that allows for good movement throughout the RV. Second, it sleeps 7 very easily. Third, it has an abundance of windows – so for those that like to see outside from their bed, there are windows by every sleeping area (3 in the bedroom!) that make for excellent views from almost every space. For a smaller Class C with plenty of sleeping areas, the Thor Chateau is worth checking out. P.S. This content was originally shared in our “From the Road” newsletter, so if you enjoyed this post- please sign up to get our newsletters in the future! We are novice RVers so the Forester 3011DS is the first motorhome we’ve ever taken out on the road. For starters, we have a boy (9yrs) and a girl (11yrs) so the multiple sleeping options were great for enabling everyone to have their own space.Specifically, the cab over bunk option with the privacy curtains and cup holder made it seem like my daughter had her own little room. She quickly figured out she could control her own light and air vent, so she was very happy. Given that my son was a bit jealous, she invited him up to hang out with her in “her space” while my husband whipped up a quick dinner. (I also made a quick trip up there and would like to note there was plenty of room for the two of us. My daughter is 4′ 10″ and about 120 pounds as well. With the max weight of 220Kg, two kids could easily sleep in the bunk over cab.) With the safety netting it also provides some good extra storage for bedding, blankets and pillows while on the road. We are not “foodies” while we are on the road, so most of our cooking was more basic in nature. My husband and I both cooked eggs and sausage for breakfast and some hot dogs for snacks. The propane 3 burner stove made breakfast a breeze in the morning (we ate lunch and dinner with friends.) That said, the fridge had plenty of room for us for the weekend. Truthfully- there was more than enough room for a 3 day weekend and we had a full gallon of milk in the fridge the whole time. We did have to make an effort to tidy after every meal, because the long counter along the kitchen side seemed to encourage leaving things out. That said, it was good to have the counter room to set out plates and cups with food on them for the kids to take to the dinette.The sofa converts to a queen-sized sleeper and was quite large once opened up. To keep things simple, I brought a fitted queen size sheet from home and slipped that right over all the sofa cushions so it felt more like a bed to my son. With a blanket and a pillow he was all set, and picking up in the morning was quite easy. The only downside to the sleeper sofa being large is that once it was down, it was harder to get to the bunk over the cab to wish my daughter good night. It also cut off access to the seats in the cab, but since we put up the privacy curtains first that was also no big deal.While talking about the interior living space it is worth noting that there are plenty of TVs (3 to be exact) and that all the inside and outside speakers can be controlled from one central panel. There is also a main control screen by the dinette and in the bedroom so lights, AC, propane, etc., can all be controlled by the touch of a button.One of our biggest surprises was the queen bedroom! My husband and I share a king-sized bed at home, so we were unsure about what kind of sleep we would get in a queen. (Especially since an RV queen is a bit smaller than a standard queen.) The mattress that comes in the 3011DS is outstanding! While it was a bit smaller, it made up for the size in comfort. Again, we brought sheets and a blanket from home, and once the bed was made up it was quite cozy. Also, the slide-out gives the back room the feeling of being a bit more spacious, but the small walk space in front of the wardrobe is really not suitable for a larger person. I am 5’2″ and 120lbs and I found it a bit tight. I could stand, and open doors and stuff, but often found myself sitting on the bed while getting items in and out of the wardrobe. The wardrobe itself is lined with cedar, which was a nice surprise. Cedar is a natural bug repellent and has a nice light scent too! Everyone talks about the small showers and bathrooms in RVs, so I would like to share a couple of things we noticed about this model that made it very functional. The multi-purpose bathroom door made it much easier for individuals to maintain their privacy while showering. Since we were at the lake, all of us needed showers in the evening, and we were all able to cycle through that process by closing the bath & bedroom section of the motorhome off, while the rest of the family hung out in the living area eating and visiting before bed time. The shower also has privacy glass- so you can see a body in there, but not the actual person. The privacy glass came in handy when one person was in the shower the next morning and another needed to use the toilet. Once again- the double duty door afforded the person that needed to relieve themselves their privacy without taking privacy away from the person showering.Since we were only out for a few days, and were at an RV resort, we were hooked up to city water and power. That said, my husband did empty the black water and grey water with no issues. When we were doing our walk through at the dealership, our tech commented on how “nice” the black tank hose was. These new hoses use clamps to secure, rather than a twist-type seal, which made the hook up and take off super-easy.Also, we drove to the RV park on Friday night, on Memorial Day weekend. My husband said the 3011DS handled “okay” but since he drives a sports car, he noticed a good bit of slack in the wheel. It was not as responsive as he was used to. However, after the drive back during the day and said it was much easier and he felt much better on the 2nd drive.In closing, the 3011DS is a sweet Class C that will easily sleep the 7 as specified. For us, we felt that having 7 in the unit would be a bit full, but for our family of 4 it was perfect. For our first trip out, we were really pleased with all the storage and how easy it was for people to have some personal space at the end of the day. We can definitely recommend this unit for a family of 4-5.